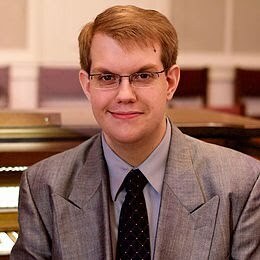 (2016 -) Daniel L. Dorty serves as Director of Music and Organist for the Camp Hill Presbyterian Church, Camp Hill, PA.
Mr. Dorty is the collaborative pianist and organist for the acclaimed Susquehanna Chorale, under the direction of Mrs. Linda L. Tedford, artistic director, founder, and conductor. He is also the collaborative pianist and organist for the Messiah College Choral Arts Society and serves as an accompanist in the surrounding communities. Mr. Dorty studied sacred music at Messiah College with a concentration in organ. His private teachers include Linda L. Tedford, Joan Frey-Boytim, Susan D. Shuey, Helen-Louise Wagner, C. Randall Williams, and Shawn Gingrich. Mr. Dorty is a member of the American Guild of Organists and the American Choral Directors Association and also has a private studio teaching piano, organ, and voice. (2012 - 2014) Ellen Hunt has served churches in New Jersey, New York and Connecticut as organist and choir director. Ellen was organist at Market Square Church for nineteen years, and a teacher in the Harrisburg School District. During that time she played organ concerts in the United States and Europe. Currently she is a substitute organist for churches in the Harrisburg area. Ellen is a graduate of Westminster Choir College and Columbia University. Post graduate work was at Cambridge College in Cambridge, MA. She has been Dean of the Hartford CT and Harrisburg PA chapters of the American Guild of Organists. After moving back to PA in 2002 she joined a writers’ group in York, and recently published a memoir. In 2008 Ellen moved to McAlisterville where she lives with her family. We extend Christian Sympathy and Hope of the Resurrection to the family of our friend and accompanist, Bill Ingraham, who passed away in July of 2012. (1996 - 2012) Bill was one of the most sought after accompanists in Central Pennsylvania - having accompanied the Central PA Oratorio Singers, Susquehanna Chorale, Messiah College Choral Arts, other choral groups, various theatre groups, and opera companies. He frequently accompanied singers and instrumentalists in area concerts. From 1986 Bill had served as organist at First United Methodist Church, Mechanicsburg and Otterbein United Methodist Church, Boiling Springs. He had been employed by the Social Security Administration for more than thirty years and was a graduate of Lebanon Valley College.